That’s all folks! France won, Croatia should have won and Russia managed to bolster its poor international image. 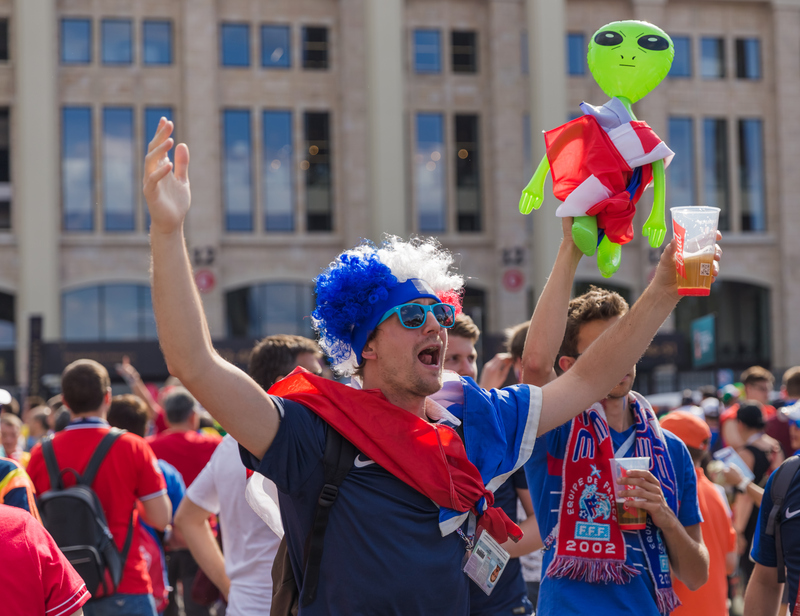 But the recent outbreak of flag-waving, goal cheering and meme-making, otherwise known as the World Cup, also offers a partial rebuke to the idea that in an era of rapid globalisation nations are no longer relevant to people’s lives. In England, the ability of the national team to avoid abject humiliation, and somehow stumble into the latter stages of the competition, generated scenes of wild celebration and led some to ponder on the difference between ‘healthy patriotism’ and nasty nationalism. This is in accord with most people’s understanding of nationalism as something pernicious, extreme or uncivilised that generally involves snarling, shaven-headed brutes or callous right-wing ideologues. However, this is a common misconception. Nationalism is, at its heart, a belief system that argues that the world’s population can be divided into discrete cultural units, each of which should have their own territory and distinct forms of political organisation. And as a wealth of recent research into the topic has shown, it is an idea that permeates the everyday conversations and habits of substantial numbers, whether that be; politicians addressing potential voters, television adverts selling ‘home-grown’ produce, stand-up comedians telling jokes or ‘ordinary’ people down the pub. In other words, if we limit our understanding of nationalism to the extremes we both miss out on the ways in which it frames so many aspects of our everyday lives but above all what it might offer to people in the contemporary era. At the macro-level, sporting success has been seen to boost national morale to the extent that some have claimed that World Cup success or defeat can tip the balance in a general election. Others suggested that success in the 1998 World Cup provided France with a new narrative of national renewal, with the team a symbol of the country’s dynamism and diversity. Many of these claims, of course, remain speculative and we also need to be aware that many people have little or no interest in such sporting occasions. For those that do participate, whether attending games, watching them on television or discussing the latest results, what might such apparently un-remarkable activities offer and what can they tell us about the link between sport and nation? First and foremost, participating in mass rituals associated with sport can be a whole lot of fun! Singing songs, drinking beer, jumping up and down to celebrate a goal, sharing memes on social media, even moaning at ‘your’ team’s inability to do something right, can be a cathartic experience. Moreover, these activities are generally saturated with emotion (happiness and laughter, frustration and anger, sadness and disbelief) which makes them particularly evocative and memorable. Often myriad individuals will have little trouble remembering exactly where they were when that goal was scored or that penalty was missed. In the process, such tournaments provide shared reference points for people who might otherwise have little in common. Wider conversations about events, such as the World Cup, not only grease the wheels of social life but allow people to debate who and what is important to them. And these debates surely carry greater significance in an era that has been increasingly associated with isolation, loneliness and fragmentation allowing individuals to connect, however briefly, and acknowledge each other as members of the same social group. Second, these communal displays (local activities in pubs, high streets and domestic homes, often blanket media coverage, shared conversations across social media platforms) provide ‘evidence’ that the nation continues to matter to substantial numbers. As Barbro Blehr, writing about Norwegian Constitution Day celebrations, observes, “when people engage, once a year, in the [day’s] activities … they confirm … that the Norwegian community exists, and that they are themselves part of it”. In other words, these events matter because they demonstrate that national symbols and solidarities still resonate with people around the globe. Now one might, of course, argue that the World Cup is an anomaly. It comes around every four years, people get very excited for a few weeks and then put away the flags and the face-paint and get on with their lives. However, any collective requires moments or periods when it’s member are able to demonstrate their ongoing commitment to the larger group and major global sporting events (alongside national holidays and commemorations, royal weddings, state funerals, the response to natural or man-made disasters) are excellent examples of this. Finally, there is a broader point to make about the international dimension of events such as the World Cup. When thinking about the significance of nationalism in the contemporary era, we should never underestimate the crucial link between the particular (individual nations) and the universal (the geopolitical order of nations) in underpinning, and reifying, national forms of organization and imagination. The World Cup reiterates a common sense ‘grammar of nationhood’ with its individual national teams competing in their national kits, singing national anthems, referencing national histories and being cheered on by national audiences. Furthermore, in reducing complex human populations to the activities of a select number of elite representatives, such sporting events not only make even the remotest country seem familiar and knowable but, just as importantly, allow all nations (even those that are barely holding together) participate as equals on the international stage. In the process, the international system of governance and socio-political relations are both naturalised and legitimised. The fact that so many of these features are still considered unremarkable shows the extent to which nationalism continues to pervade our understanding of how the world is (and should be) organised but also its significance beyond the standard debates around nasty populists and good patriots.